The growth of the Middle East & Africa UPS market in the coming years is expected to be driven by several factors such as rising IT spending, increasing number of SMEs and growing number of data centers, healthcare facilities, ATMs and hotels. Saudi Arabia, Turkey, South Africa and Nigeria would be the key emerging countries in the entire Middle East & Africa region. Amongst all applications, the commercial sector has captured the highest Middle East & Africa UPS market share in 2017. In the commercial sector, data centers, BFSI and hospitality segments were the major revenue shareholders and are expected to maintain their dominance in the coming years on account of government emphasis on developing the social infrastructure. The Middle East & Africa UPS market report comprehensively covers the market by KVA ratings, applications and countries. The Middle East & Africa UPS market outlook report provides an unbiased and detailed analysis of the Middle East & Africa UPS market trends, opportunities/high growth areas, market drivers which would help the stakeholders to device and align their market strategies according to the current and future market dynamics. •	Historical data of Global Uninterruptible Power Supply (UPS) Systems Market Revenues for the Period 2014-2017. •	Market Size & Forecast of Global Uninterruptible Power Supply (UPS) Systems Market Revenues until 2024. •	Middle East & Africa UPS Market Overview. •	Middle East & Africa UPS Market Size and Middle East & Africa UPS Market Forecast. •	Historic data of Middle East & Africa UPS Market Revenues and Volume 2014-2017. Revenues & Volume Market until 2024. •	Historic data of Middle East & Africa Below 1.1 KVA UPS Systems Market Revenues & Volume Market 2014-2017. •	Historic data of Middle East & Africa 1.1 KVA - 5 KVA UPS Systems Market Revenues & Volume Market 2014-2017. •	Historic data of Middle East & Africa 5.1 KVA - 20 KVA UPS Systems Market Revenues & Volume 2014-2017. •	Historic data of Middle East & Africa 20.1 KVA - 50 KVA UPS Systems Market Revenues & Volume 2014-2017. •	Historic data of Middle East & Africa 50.1 KVA - 200 KVA UPS Systems Market Revenues & Volume 2014-2017. 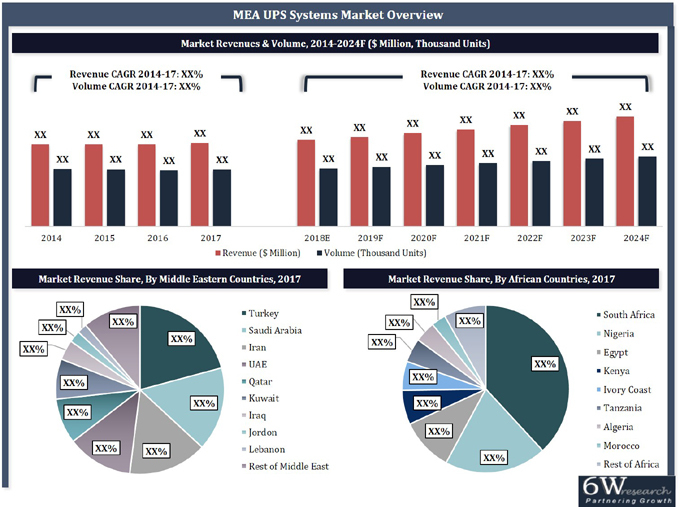 •	Historic data of Middle East & Africa Above 200 KVA UPS Systems Market Revenues & Volume 2014-2017. •	Middle East & Africa UPS Market Trends, Drivers and Restraints. •	Middle East & Africa UPS Market Overview on Competitive Landscape.